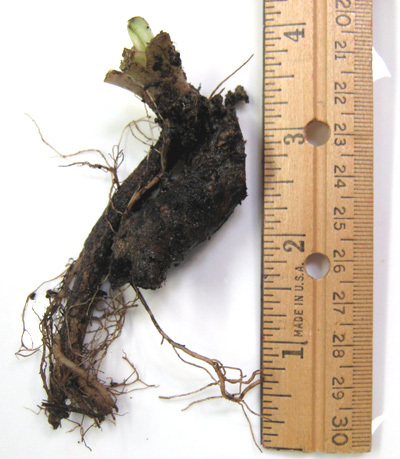 Comfrey can be planted any time soil is not frozen. Live roots, seeds, dried root, oil. "Animal Fodder: It (comfrey) is protein rich with 15 to 30% dry-weight protein content, rivalling some legumes." "It is used as a pig fodder successfully in amounts up to 80 to 90% of the diet! For poultry, it can reduce the need for other feed (be that your concoction or processed feed) by 50%. Egg quality will improve with yolks being brighter." "Cows don�t bloat when eating comfrey like they do with clover. And too much clover can taint the milk � not a problem with comfrey. Also, mastitis is reduced in cows fed comfrey." "Wilted comfrey mixed with straw fed to sheep at a ratio of one part comfrey to one and a half parts straw increases the digestion of the straw." 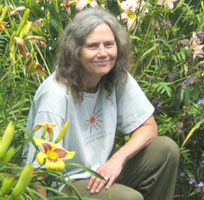 Grow your own animal food with perennial comfrey. I feed comfrey to my goats, ducks and chickens. They love it. 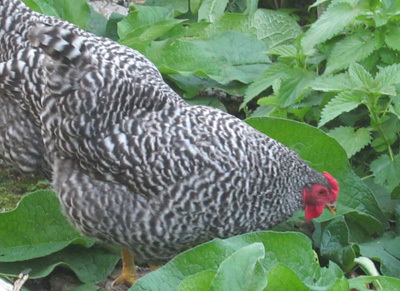 It is better to plant comfrey where chickens and other animals can not eat or peck at them all day. They like it so much that they kill it. Plant it away from the animals and then cut the leaves off and bring to them. Or use rotational grazing. In this photo the comfrey is mixed with other plants such as yarrow, clover, chicory, dandelion, plantain, vetch and grass. I let the goats in here for a few days, then close the gate so the plants grow back. For my chickens and ducks I throw the comfrey on the ground or in a weed rack. This photo is a poultry weed rack. They eat the entire herb. All my animals get very excited when I feed it to them. I used to have pigs and rabbits, and it was a great treat for them. Sheep, cattle and other farm animals like it too. Consult your veterinarian or animal care specialist about comfrey and your livestock and pets. 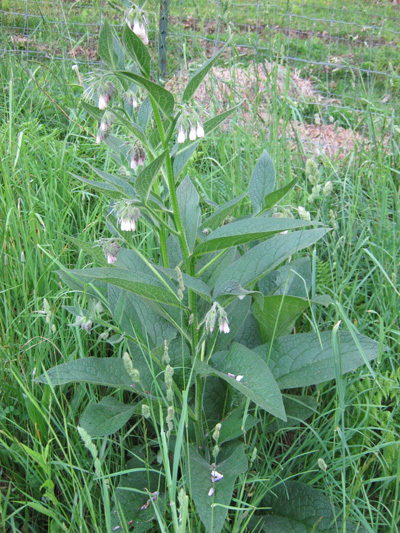 "Comfrey is well-suited as a feed for chickens. 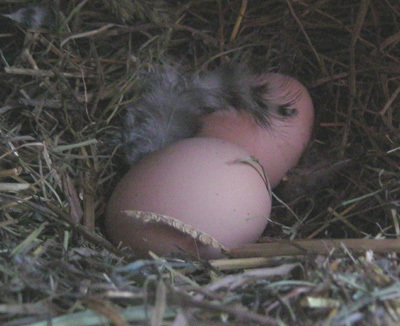 Chickens� digestive systems are not equipped to handle much fiber. Comfrey is low in fiber and high in protein and minerals, especially when cut regularly. It has a protein to fiber ratio of about three to two." "If the high-yielding Bocking 14 strain of comfrey is planted, 30 plants spaced at 3 feet by 3 feet will yield enough comfrey to feed 12 birds their entire allotment of green plant matter." 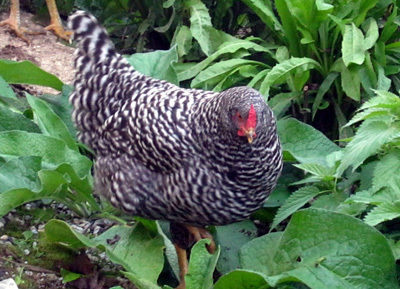 This photo is a Dominique hen in comfrey, stinging nettle, and chicory. "Comfrey can be an inexpensive source of vitamin A. Second-year hens fed half a ratio of comfrey laid large eggs with deep yellow yolks. The flesh of chickens that have been fed comfrey also ends up being more yellow, perhaps because of increased vitamin A content." "Chopping comfrey with a chaff cutter is especially recommended for birds less than eight weeks old. Another method for feeding comfrey to chickens is to hang it on a string and let birds jump for it (so it doesn�t get trampled on)." "Vitamin A is a fat-soluble vitamin. Supplied in concentrated form to the poultry mash it is extremely expensive, but a deficiency produces disastrous results. Because Comfrey is the cheapest of all sources of Vitamin A in terms of labour, it deserves experiment by poultry stations, and by private poultry farmers. Ample Vitamin A would mean good colour in the egg yolks for the whole period." "Though Comfrey seems of considerable value to growing poultry, before eight weeks old it should be fed chaffed." Chaffed means cutting into chick- or duckling-sized small pieces. 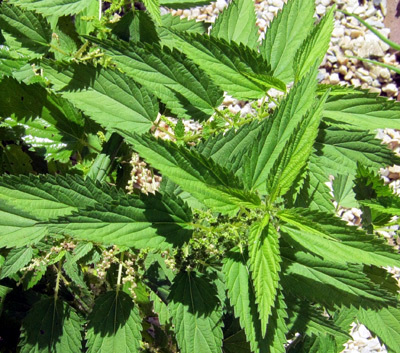 "Two extremely useful plants I recommend to all homesteaders are comfrey and stinging nettle." "In addition to myriad food, medicinal, and soil-building uses, both plants are excellent feed for poultry. Protein content is high (higher than alfalfa, and can if well grown be as high as soybean, dry weight basis)." 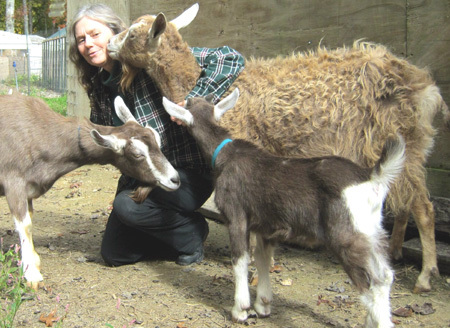 "I cut and feed as needed, more at times in the season when the pasture is less generous. 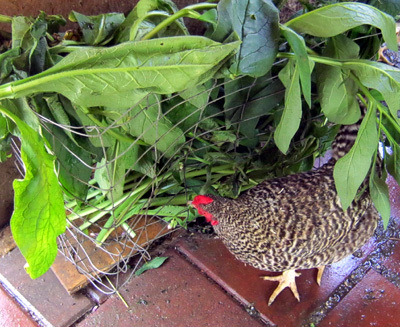 Chickens eat comfrey well. Geese love it. Both comfrey and stinging nettle can be dried and fed as hay." 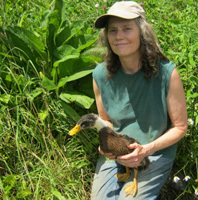 The first photo is a Dominique hen in comfrey and stinging nettle. Then stinging nettle with seeds. 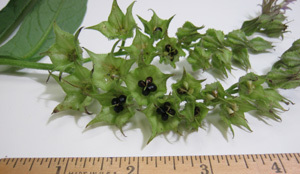 I sell Stinging Nettle seeds. 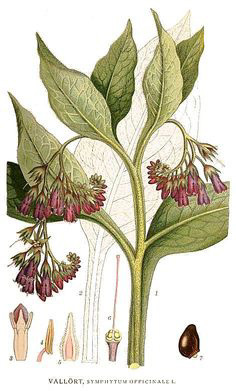 "United Kingdom Henry Doubleday research had many years of documented information, freely available, that showed data of high comfrey concentrations that could be fed to animals. Some were 50-80% of daily fodder." The Henry Doubleday Research Association was founded by Lawrence D. Hills in 1954. Henry Doubleday (1810�1902) was a Quaker farmer who devoted most of his life to promoting comfrey. 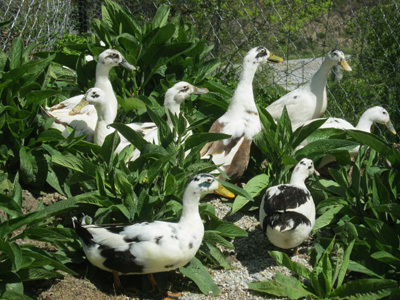 The first photo is Ancona ducks walking among comfrey plants. 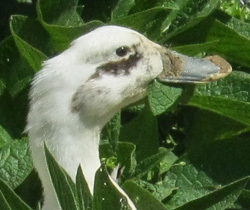 One duck has a comfrey leaf in her beak. She looks happy. 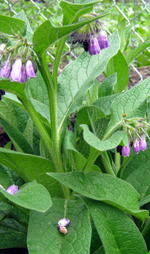 "Comfrey is very widely used in Japan as an animal fodder, without any ill effects, evidently." 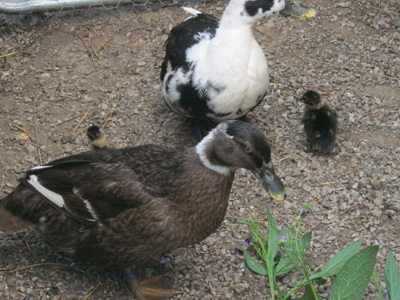 "And I have spoken to several homesteaders who regularly give small quantities of comfrey leaf to their chicken or duck flocks and even to pigs. The chickens absolutely relished the stuff. 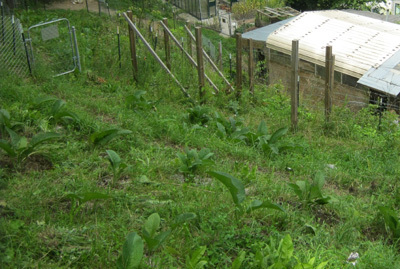 I never observed any detrimental effect on the hens after feeding them comfrey leaves." Grow your own Comfrey: True/Common Comfrey, Russian Bocking #4, and Russian Bocking #14. Your order includes a flyer about how to take care of your plants.